The hype surrounding the 2018 Dodge Challenger SRT Demon has settled down over the past few months, but it’s about to pick right back up again as the first Demons are shipping out to dealers today. That means very soon these muscle machines making as much as 840 hp will be let loose on the streets. If you somehow missed the months-long barrage of Demon coverage earlier this year, here’s a quick refresher. The Demon is a widebody variant of the Dodge Challenger that’s purpose-built for drag racing. It’s powered by a supercharged 6.2-liter Hemi V-8 that makes 808 hp and 717 lb-ft of torque on pump gas or 840 hp and 770 lb-ft on race gas. The Demon rides on specially designed, street-legal Nitto NT05R drag radials and gets a host of other goodies that help it hit 60 mph in a claimed 2.3 seconds and do a 9.65-second quarter mile on an NHRA-prepped surface. Just 3,300 copies of the 2018 Dodge Challenger SRT Demon will be sold, with 3,000 allocated for the U.S. and 300 bound for Canada. As we previously reported, Dodge built the lowest-optioned cars first to ensure the initial batch went to drag racers and also to curb dealer price gouging. Demons that sold for much more than its $86,090 MSRP will be built last, which is why the Demon’s best options are priced at just $1. One of these options is the Demon Crate, which gets you everything you need to go drag racing and unlock the car’s full 840 hp. 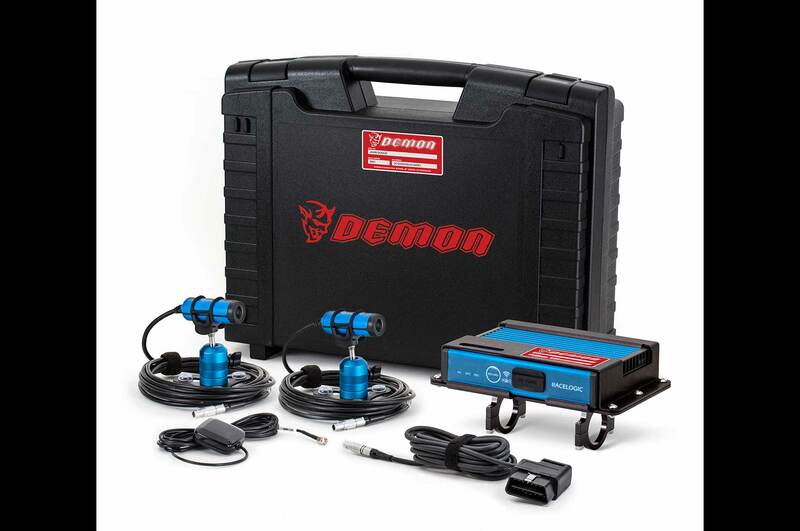 Also look for the $1 Demon Authentication Package, which has documentation on your car’s build process, a carbon-fiber Certicard with your name and the car’s VIN and serial number printed on it, and a portfolio for safe keeping all your original documents. Another feature not previously detailed is a special Racelogic VBOX video and data system. The option includes a VBOX data logger and an in-car HD camera setup for tracking your runs on the drag strip. Now that customers are taking delivery of their Demons, it’s only a matter of time before we can get our hands on one and take it to the track to see what it can really do.